“A noodle soup”. Like this the critics referred to the paintings of Jackson Pollock in the time he brought them into light. 60 years after, a canvas of this noodle soup, No 5, was sold in 150 million dollars, being the most expensive painting ever sold. 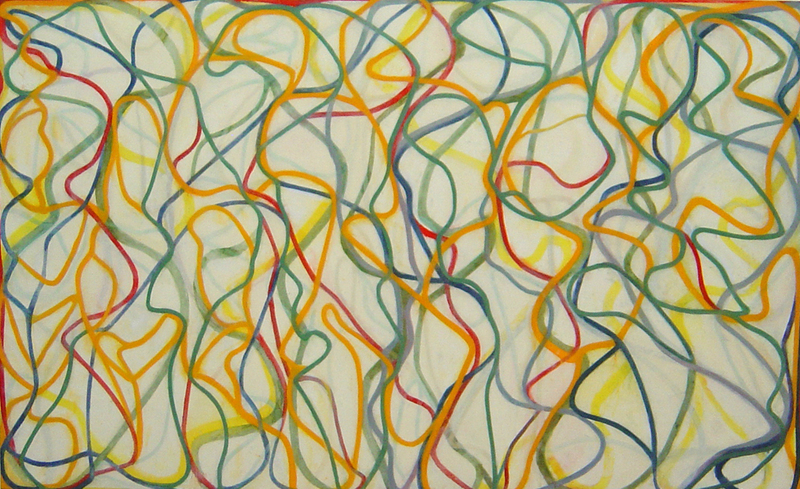 Marden is an artist born in New York and was devoted for decades to minimalism. If you look at his work, you will not see more than sober and uniform colored squares. However, in the 80s, he turned into formalism, where is emphasized the lines, the color, the shapes and textures; leaving aside realism, context and content. He then began with a series called Cold mountain, inspired in the work of Han Shan, a Chinese poet. Later on, he added color and began with the series called Study for the muses. Hydra version (?). The canvases in this second series are very large (the painting we see today has a size of 2.5m x 4.5m) and, to paint them, he would drag a sprig of coriander with paint on a linen surface. While the Pollock’s noodles are intense and dramatic, The muses from Marden offers us a feeling of unity and calm but, at the same time, of an infinite complexity. ~ by Álvaro Mazzino on August 4, 2010. The promotion is happening on China’s Facebook equivalent ‘Sina Weibo’, and customers will need to be in China to take part in it, but that’s a good thing I guess, that Microsoft isn’t handing out free iPhone’s internationally. The Samsung Galaxy S6 Edge, on the other hand, has amassed 88 and 84 points. The recently launched Google’s Huawei-made Nexus 6P has tallied a score of 86 and 79 points. It’s been more than 25 years since Pat O’Malley ran competitively at the University of Maine, but the executive is still vying for a top spot in the running space. This entry was posted on August 4, 2010 at 10:02 and is filed under Uncategorized.You can follow any responses to this entry through the RSS 2.0 feed.You can leave a response, or trackback from your own site.